Hey Index III, more arcs like this one, please! 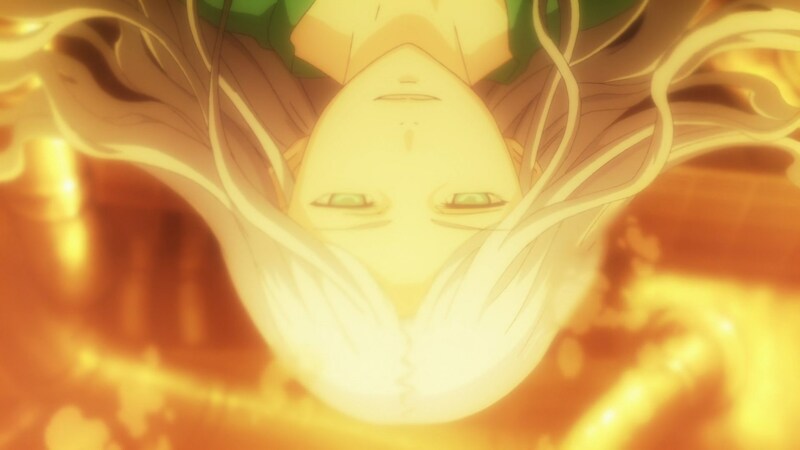 Well, there we go, the first decently good offering from the third season of To Aru Majutsu no Index. I’m not entirely sure if we’re going to get another arc that doesn’t require large amounts of research into the source material, but man did I enjoy going through this particular arc. It had everything that I remember the Index core series doing oh so well. Great character moments, interesting dialogue, solid philosophical points of view, solid action and a good deal of nice comedy. And again, it wasn’t perfect, but I’d say this was the one arc from this third season, that was actually kind of watchable by anime only viewers, kind of. It was at the end of the episode, when all this arc’s relevant stuff was said and done, that the series went back to its rather bad habits. 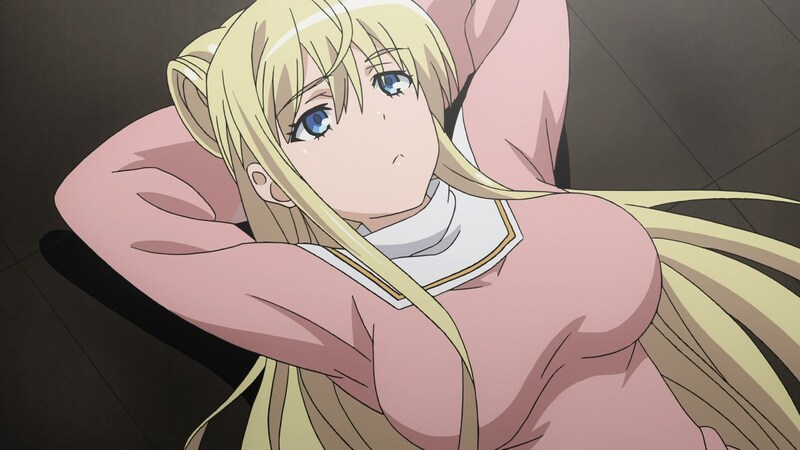 The setup for the larger story, which happens near the end of the episode, left me scratching my head, and once again, I had to venture into the weekly Index III reddit thread on r/anime (with Razorhead and KinnyRiddle’s comments being particularly useful) to get a handle on everything. I will say this, that if you do make a similar move, then tread with care, as there are spoilers (all tagged/hidden) in that thread all over the place that can spoil as much as the sequel story to Index (New Testament). So, we’ll certainly get to what this arc means for the larger story of index, but first, I want to talk about the good stuff. 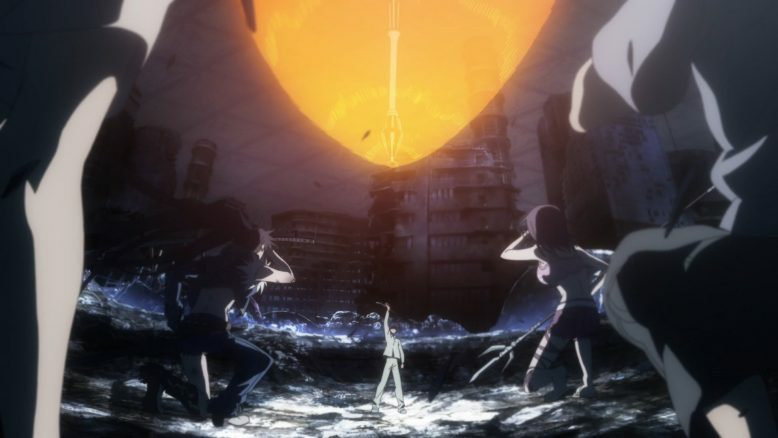 For one, I really enjoyed the overall battle between Kanzaki+Amakusa and Accqua. It’s nice to see that even this far in, characters like Kanzaki who you could say is kind of a secondary supporting character, are getting some development and growth. For Kanzaki, it was a big moment to see her identify her own arrogance, reject it and join up with her old comrades and friends. As she said, she was being a bit arrogant in her belief that SHE would protect her comrades and friend by seperating herself. The logical idea of her accepting her friends as equals and working with them to take down Accqua, was just great to see. 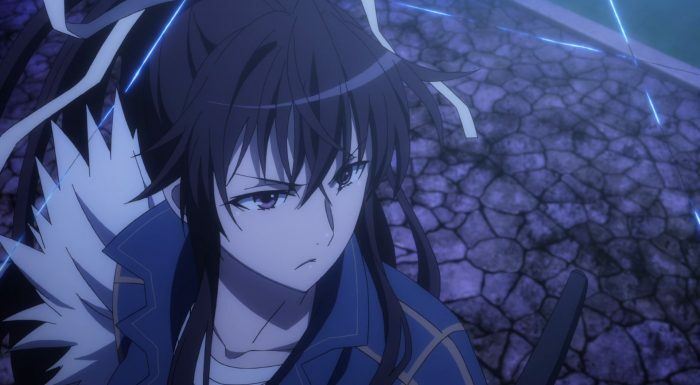 Plus her kind of figuring out Accqua’s little trick mid battle, was certainly logical and understandable, even if the show didn’t do the best job of explaining what was going on. Basically, Accqua due to his birth background, was pretty broken, having two disparate abilities basically giving the ability to full use his Saint powers. Saints, as Kanzaki reveals, generally can’t use their full powers, because their bodies can’t stand them. I won’t go into the detail of Accqua’s powers, because well, the reddit thread can give you that information, but its adapted from the idea of Jesus in Christianity and his mother Mary. In any case, what matters is that Kanzaki figures out that one of Accqua’s powers is able to allow him to unleash his full potential, and because of that power, she stumbles upon his weakness. Which is, of course, The Amakusa attack that overloads a Saint’s powers. So yeah, the group works together to try and overload Accqua’s powers, thereby finishing him off. Of course, Accqua has all his powers at his disposal, and it takes a timely intervention from Touma and his Imagine Breaker, to give Kanzaki and Itsuwa the opening to unleash their combo attack. Which, then brings us to Touma. I loved his exchange with Mikoto right before he arrives on the scene. For one, I think it kind of gives people a bit of insight into why some of us are huge Touma fans. Touma is basically a guy who does the right thing, and can’t ignore evil. He saves people who need to be saved, he comes in and helps when he can, and this week he quite plainly reveals, in his own delirious state, that its his heart and his core being that that comes from, and not his memories. At his core, Touma is just a great guy, and thus Mikoto’s whole thing and worry about his memories is an unfounded one. Touma is still Touma, and Touma is the sort guy who would continue to do good and act like a hero, because that’s just who he is, memory or no memory. Now, as for the big moment where Mikoto basically reveals that she knows about Touma’s memory loss, well that certainly has interesting implications. For one, it seems like the show and the franchise is definitely angling Mikoto towards the whole “getting over Touma” direction. See, I’m one of the people who believes that she totally should’ve followed Touma to whatever danger or thing he was in. Yes, I get that she’s impressed by his whole declaration of well, being him and why he does what he does, but I also don’t see any logical reason why she couldn’t have gone to help him. Its simple one of those cases where the plot and the author just doesn’t want Touma and Mikoto to be in the same world (yet?). 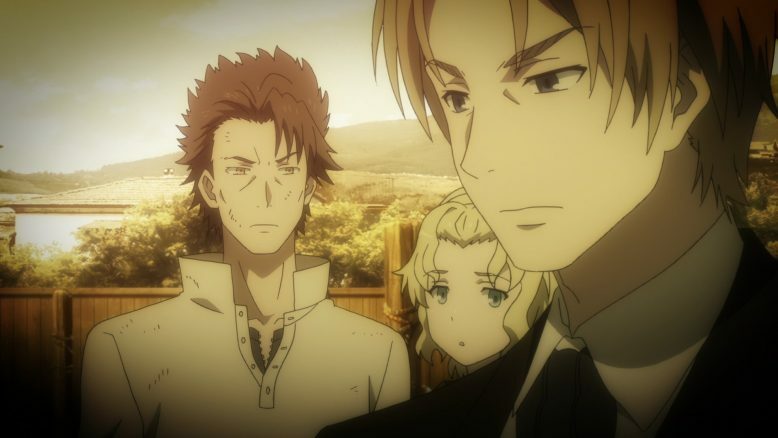 See, I’ve heard that Mikoto is featured pretty heavily in New Testament (which is the sequel to the current third seasons worth of story), but it seems like for now, Touma and Mikoto are going to be very much apart in terms of what they do and where they operate. So, beyond Mikoto’s weird decision to not go with Touma, her two realizations in this exchange are pretty big. The first realization is around the differences between Touma and herself. I think Mikoto is really starting to realize how different her world is from Touma. 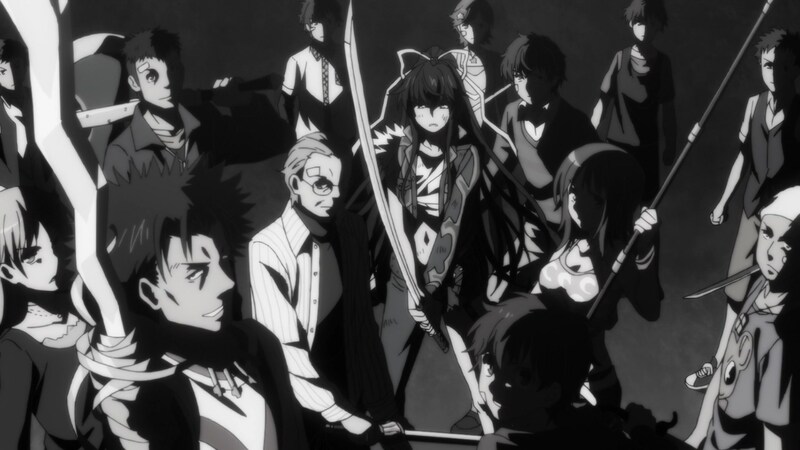 Touma is involved in massive things, things that may very well be beyond her. 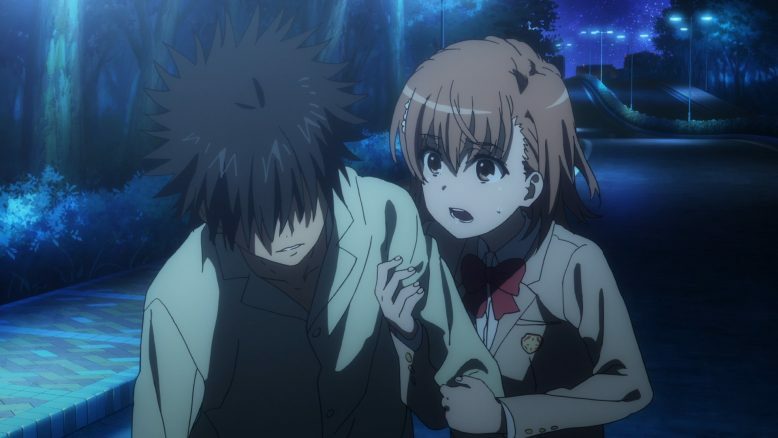 Its not that Touma doesn’t trust Mikoto or want her help. its just that he realizes that the magic stuff is way beyond what she can handle. And it probably is, Mikoto’s Esper powers are strong, but I’m sure she’d have quite a hard time taking on magical opponents. 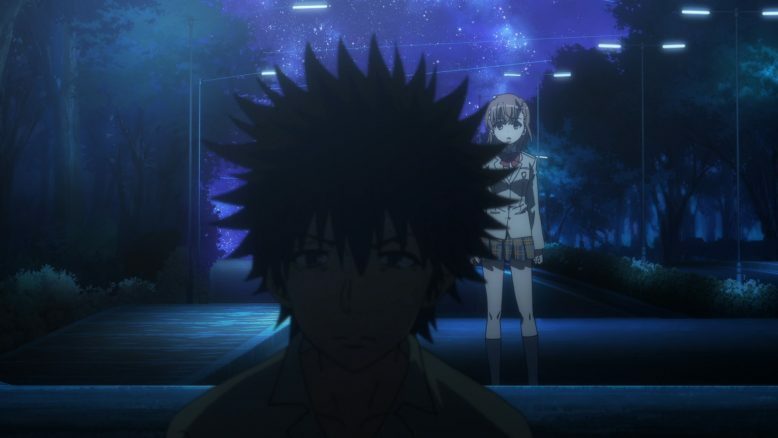 Its not that Touma doesn’t want help, its that he’s never considered using Mikoto or her powers, because they’re rarely a solution to any of the problems he faces. Most of the time, Touma’s own Imagine Breaker and whatever allies he has at the time, get the job done. Which, I think is fine and dandy, and it at least puts some logic behind Touma’s actions regarding seeking help. Much like Index (who only has knowledge, not fighting ability), Mikoto is rarely ever needed, so Touma doesn’t bother either of them. Now, the second realization, is the bigger one. 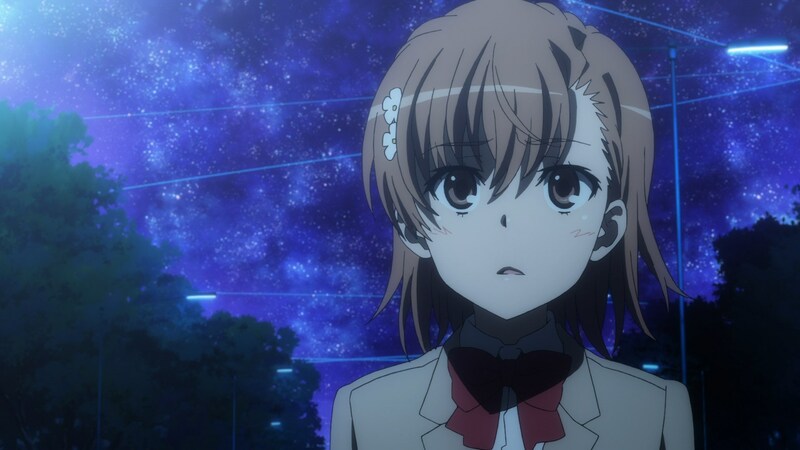 Mikoto now realizes why she’s so concerned with Touma, and its obviously because she’s in love with him. Now, its worth noting that WE as the audience know that, a lot of the side characters like Kuroko know that, but Mikoto herself has never realized this. Which makes sense, I mean, the girl is just barely a teenager that only recently was a middle schooler. Touma and her whole crush around him is really her first experience at this whole love thing. And man, I gotta say, I REALLY feel for Mikoto, because the first guy she’s fallen for, is well, hard to compete with, to say the least. That said, I’ve always loved the idea of a Mikoto x Touma thing, even if the franchise as a whole is moving away from it. I mean, it seems like the show, with MIkoto’s realization that she’s in a different world from Touma, is suggesting that she basically has to accept her feelings for Touma (Which she just realized) and then kind of move on. So while this was and probanly will be my favorite ship in the shipping wars, I’d say that its very unlikely that it’ll become cannon. Especially with girls like Itsuwa in the mix. Itsuwa definitely is in the lead here. I will say that out of all the girls, Itsuwa and Touma have the best chemistry, so there’s that. I don’t actually view Kanzaki as a serious contender, because her whole Angel maid thing was more of a comedy joke, and basically Tsuchimikado messing with her. It was all good though, and I appreciated the fact that the show didn’t actually show us Kanzaki’s “maid” appearance, it would’ve ruined the joke in all honesty. Now… As for what’s coming down the pipe, well we got introduced to the big bad of I think this whole war between Academy City and Roman Catholic Church, Fiamma. Fiamma is the leader of the right seat group that Accqua was a part of, but its in his reveal that we learn of a few key things. One, not all of the right seat is actually aligned, with Accqua, Terra, Vento and now Fiamma each having their own agendas. in Fiamma’s case, he’s power hungry, and he actually has a certain ability that is the exact opposite of Touma’s. 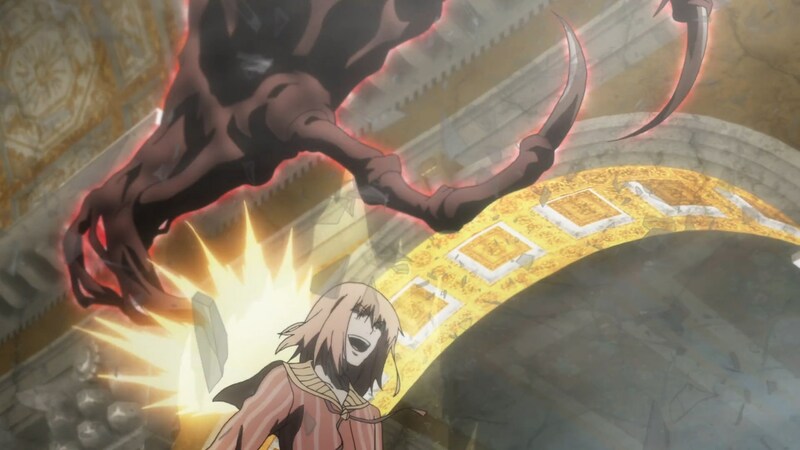 If Touma’s Imagine Breaker can nullify all miracles and supernatural things, then Fiamma’s right hand basically creates Miracles and Supernatural things. So yeah, you can see where this is going, and I think its certainly interesting to have someone kind of equalize Touma’s frankly pretty powerful ability. Of course, what Fiamma wants now more than ever, is the knowledge that is basically housed inside Index, so we’re going for a pretty solid collision course between Academy City and Fiamma himself. Beyond that, I suppose its worth talking about Accqua and his motivations. As the slight flashback kind of hints at, Accqua isn’t actually a bad guy, and his whole reason for joining the right seat is to basically keep everything in balance. When Accqua realizes that Academy City+The Angelican Church are going to go to war with the Roman Catholic and Russian Orthodox Churches over the Imagine Breaker, well, he decides to remove the actual trigger of said war. It obviously doesn’t work out, so now with Accqua’s ploy failed, we’re basically gearing up for that big war, with Fiamma more or less at the helm. The final piece of setup, and the thing that confused me a bit, was Aleister himself. So Aleister has this whole thing about his calculations and in particualr is the 98% Imagine Breaker number. So what happens here is that the resulting blast from Accqua’s powers being overloaded, kills Academy City’s underline network (the one that Accelerator and co defended in the last arc). 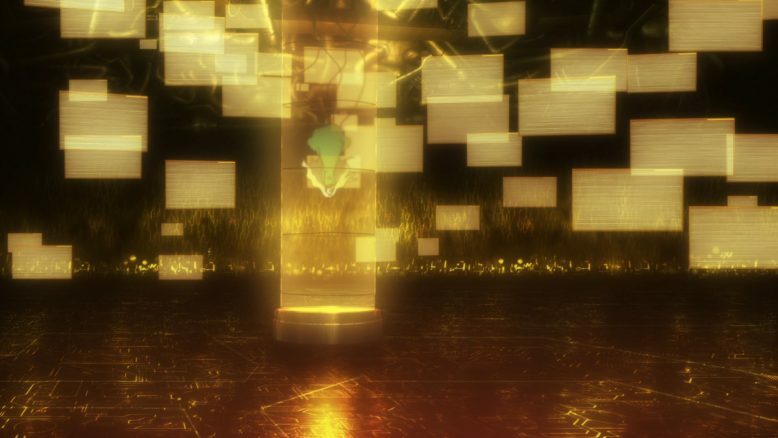 Before that, however, Aleister is able to analyze Touma’s Imagine breaker and its capabilities to about 98%. So, its quite clear that in Academy City, Aleister’s two big guns and weapons are both Touma and Accelerator, with each serving a very different purpose in whatever big high level power battles Aleister is fighting here. Considering there’s word that the people behind Index III wanted to skip to New Testament entirely, I guess we’re kind of lucky to even get this. Its sad, because if this arc proves anything, its that the Index franchise has a lot to offer if its adapted right. J.C Staff in particular is kind of disappointing fans with what they’re doing here. I mean, I didn’t talk about the battles or the animation this week, because it varied between serviceable and subpar. It seems like J.C Staff just took on too much this year, and its Index III that’s taking a major hit here. Which is sad, because if anything, Index is one of their more popular properties and should be given the same care and love that it once got from the studio. In any case, I’m still enjoy Index III. and a part of me really hopes that the rest of the arcs turn out as good as this one. There’s a fat chance of that happening, but one can dream, can’t they?